Engraved Divot Repair Tool and Club Holder with clip. Features carabineer and ball marker. Constructed of lightweight Aluminum and features an indentation on the top that serves as a club rest for those wet greens. A great golf promotional item that can be laser engraved. FREE RUSH AVAILABLE! Available Colors: Black, Blue and Silver. 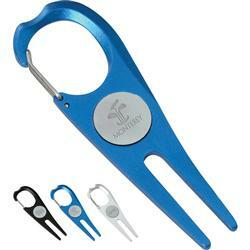 Typical Imprint Area(s): Top - 1/2" x 1/2", Back 3/4" x 3/4"
Divot Repair Tool, Ball Marker, Caribineer, Golf Club Holder, Aluminum. 22 pounds per 600 pieces.